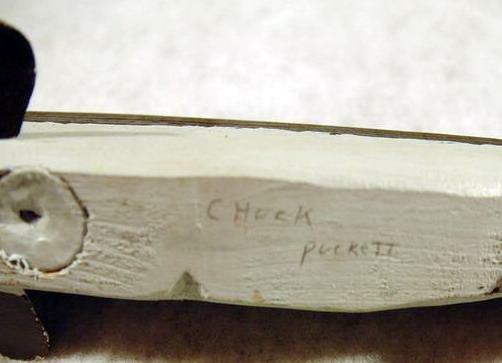 Charles B Puckett (Charlie or Chuck) 1946 to 1997 was reported to be a High School Teacher in either New Baltimore or Port Huron who lived with his wife Adrienne in New Baltimore, MI. He is reported to have started making decoys in the 60’s for spearing on Lake St. Clair. His early decoys were unbranded and functional. By the 80’s like many other carvers of that time he was making a lot of decoys which tended to be rougher and with less detail then his early ones primarily for collectors and antique shops. These were branded CP or Chuck Puckett. His decoys range in size from 2” to 15” and many are perch.